In 1763, the painter Joshua Reynolds proposed to his friend Samuel Johnson that they invite a few friends to join them every Friday at the Turk's Head Tavern in London to dine, drink, and talk until midnight. Eventually the group came to include among its members Edmund Burke, Adam Smith, Edward Gibbon, and James Boswell. It was known simply as "the Club." 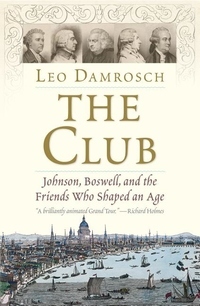 In this captivating book, Leo Damrosch brings alive a brilliant, competitive, and eccentric cast of characters. With the friendship of the "odd couple" Samuel Johnson and James Boswell at the heart of his narrative, Damrosch conjures up the precarious, exciting, and often brutal world of late eighteenth-century Britain. This is the story of an extraordinary group of people whose ideas helped to shape their age, and our own.